After the maritime victory, our country began the charge into enemy territory. On November 2nd, 1879, nearly 10,000 men disembarked in the port of Pisagua, under orders from general Erasmo Escala and accompanied by War minister Rafael Sotomayor, thus beginning a sequence of land confrontations that began with the Tarapaca campaign. The disembarkation in Pisagua was only the beginning of the advance of Chilean troops into enemy territory. Immediately, the soldiers advanced into the pampas, becoming involved in a confrontation in pampa Germania, where the Chilean cavalry resulted victorious. After this, on November 19th, 1879, both sides met at pampa de Dolores, beginning the battle of the same name that afternoon, in which general Sotomayor, along with 6,000 men, defeated the Peruvian troops under the command of general Juan Buendia. While Chile advanced at a steady pace and took over the region’s saltpeter riches, the Peruvian troops reorganized in order to continue the confrontations. This way, on November 27th, 1879, the battle of Tarapaca took place, where the Chilean forces were defeated; however, this did not mean a step back in the Chilean plans, because the Peruvians and Bolivians took refuge in the city of Tacna, leaving the path clear for the occupation of Tarapaca. The failed actions of enemy forces not only enabled the later advance of Chilean troops, it also generated a strong feeling of discontent among the neighboring nations and important changes in their respective governments, impeaching presidents that until that moment had decided the course of events. Therefore, Nicolas de Pierola assumed power in Peru and Narciso Campero did so in Bolivia. With the occupation of Tarapaca, Chilean troops where in an unbeatable position to begin a new invasion into enemy territory. Thus began the campaigns of Tacna and Arica with the disembarkation of national forces in the port of Ilo and in Pacocha (in the surroundings of Arica) during February of 1880. The confrontation with Peruvians and Bolivians was imminent because the order given to the Chilean army was to destroy all forces belonging to the enemy’s side. 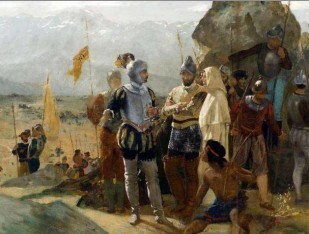 The first clash occurred in the slopes of Los Angeles, where the troops under the charge of Chilean Manuel Baquedano triumphed by a landslide, at the same time taking over the city of Moquegua. After the victory, the steady advance towards Tacna continued. Nearly 14,000 Peruvians and Bolivians were deployed on the outskirts of this city. They waited for the Chilean troops at Campo de la Alianza (Alliance Field). The Chilean troops did not top 10,000 men, however, the day of the confrontation, May 26th, 1880, they were victorious on the battle field, even achieving the definite withdrawal of Bolivian troops from the conflict and the falling back of Peruvian troops to Arequipa. Without any major obstacles, Chilean troops continued north, now with the objective of dealing the coup de grace to the enemy country. Although control of the region was nearly absolute, taking over the city of Arica was still pending, which was achieved on June 7th, 1880, when our country’s army, under the command of general Pedro Lagos, took the morro de Arica (Arica hill), strongly guarded by Peruvian troops. In only 55 minutes, Chile took over the city’s main defense. Regardless of the fact that the victories obtained to this moment left our country as the clear winner, there were some voices raised from the political world that deemed a new incursion into Peruvian territory necessary. This time, the objective was the occupation of Lima. To achieve this, a military contingent under the charge of Jose Francisco Vergara left Arica during the first days of November. On November 20th, Chilean troops disembarked at Paracas, location over 200 kilometers from Lima. The advance began from this point on, occupying several settlements with no major opposition until January 13th, 1881, date in which the troops commanded by Manuel Baquedano faced the Peruvian forces in three successive battles: the battle of San Juan, the assault on Solar hill and the battle of Chorrillos. Two days later, the battle of Miraflores would take place, in which Chilean troops performed with great skill, overcoming the fact that they were outnumbered (there were four thousand Chilean men and fifteen thousand Peruvians on the battle field) and achieving a considerable victory that enabled the capture of the port of Callao and the entry to Lima on January 18th, 1881. The longest stage of the war developed between April 1881 and June 1884, dubbed the Sierra campaign due to the backdrop of high plateaus where it took place. Although the entry of Chilean troops to the Peruvian capital was an undeniable indicator of the victory that had been attained, there were still some enemies that got organized to fight in the Peruvian sierra, trying to avoid the territorial compensation our country intended at all costs. Under the command of general Andres Avelino Caceres, the Peruvian army fought the “Division of Solitary Battalions”, as were dubbed the soldiers that sought our country’s definite victory for a little over three years. The duration of the confrontations can be explained because the enemy troops took advantage of the intricate geography of the Peruvian interior to take cover and begin a guerilla war or montoneras, in which small groups ambushed the Chilean detachments. The most important battles where Sangra, on June 26th and 27th, 1881 and the battle of La Concepcion, on July 9th and 10th of 1882. Although most of the confrontations highlighted the heroism of Chilean soldiers, it was in this last clash of forces where the national contingent proved all of their bravery. 77 soldiers died there defending the flag and national honor, without accepting surrender. Finally, the Chileans achieved the victory they longed for on July 10th, 1883 at the battle of Huamachuco. The troops commanded by Alejandro Gorostiaga once again managed to counter their numeric inferiority, defeating the enemy and leaving the path clear to search for a peaceful solution to the years of confrontations.